This summer, I had the privilege of visiting Bangladesh after living in the US for 11 years. My expectations of this growing nation were easily surpassed by reality. Even though I have seen a lot of Western influence in the everyday life of people, the life of the poor has remained the same. I was able to take a tour of a small slum school in Dhaka and it helped me pinpoint the inconsistencies in the education system there. Even though this school is constructing the future Bangladesh, it is still underfunded and government aid is limited. It is mostly run by private donations and volunteer services. This school is not only responsible for providing education, but also for offering basic healthcare to these children. Amongst all the dilemmas, I was very enlightened to hear the stories of these slum children who are now pursuing higher education. What an accomplishment! On the other hand, I was also able to see a different side of education in Bangladesh. During this same trip, a student of a very reputable university showed me her homework which she plagiarised completely from Wikipedia. And, she was able to receive a good grade on this assignment. Not so shocking at all! So, now I ask, where are the nation's priorities? As a child, I was always taught that education is imperative in shaping a strong nation. And, the United States of America is the living truth of such an assertion. Therefore, I urge the government to adopt a different education plan so that the poor are not excluded and at the same time, education is not bought by the rich. I have gone through the interview of Education minister Nurul Islam Nahid titled “Awareness is a Must” regarding the matter of stalking and sexual harassment of women, published in the last issue of Star Magazine. Having done so, I believe that the government has taken good measures so far in terms to making laws and trying to raise awareness regarding the sexual harassment of women and its consequences. Non-government organisations have also made comendable efforts to raise awareness regarding this issue. I believe that the attitutes towards women will not change overnight. Respect towards women needs to be ingrained in all men from childhood. Parents in this case have a very important role to play. Modeling respect for women within the household, teaching boys that their sisters and female peers are equal to them in every way is a good start. Schools can also teach youngsters about gender equality and respect towards women. If we work together at home, at schools and through laws, rules and regulations, we can eventually get rid of gender inequality and create a safe environment for women to live and to work. My annual vacation overseas (Zambia) does not provide me with the luxury of Internet or Bangladeshi newspapers, so I return to a mountainous stockpile of newspapers and delight in catching up on stories and news I missed. One of the most interesting reports in my absence was that headlined 'Hartals: Exercising whose democratic rights?' Sir Frank Peters approached the subject with a fresh, new, and fascinating perspective and asked why they're allowed to be so. 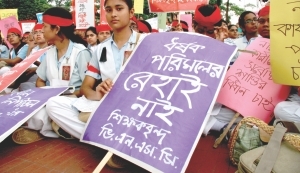 While recognising it is the democratic right of people to demonstrate in the street, he points out that people who do not wish to participate in the demonstrations or protests also are equally exercising their democratic rights and should not be harassed, abused or violated in anyway for so doing. He raised many interesting points throughout that demand attention and consideration and asked the media to consider its role and if the media inadvertently were aiding and abetting the thugs to accomplish their horrors. I urge any reader who may have not read the thought-provoking feature, to go to the newspaper archives or do a Google search. For much too long we have accepted the many evil happenings of hartals as 'normal'. The participants are viewed as 'peaceful demonstrators' exercising their democratic rights, but as Sir Frank Peters logically points out in his 'wake-up Bangladesh' report they cannot be peaceful demonstrators if they are wielding bamboo sticks, knives, house-bricks, machetes, iron rods or any other form of weaponry. Their only suitable description is terrorists and those positions are already filled, no vacancies left. If the opposition leaders do not speak out against the criminal behaviour of their supporters and do all in their power to prevent such disgraceful behaviour, (which they haven't up to now) then one can only assume they whole-heartedly support the violence and misdeeds and don't deserve to govern at anytime. How is it possible for the opposition to condemn the state of law and order in Bangladesh, if they, during hartals at least, are the main law-breaking culprits? Any political party that does not put the wellbeing of the people and the nation first, has no place in this society and that applies to all of them. It's time Bangladesh woke up to the fact the enemy is within and not necessarily those labelled as such. Forty-years of government mismanagement and feeble excuses (on all political sides) is quite enough and not what I had in mind back in 1971 for my family to inherit. I work in an office of 24 staff members. Our day always begins with views and discussions on the news of the day. That's a challenging and stimulating question that deserves and demands serious consideration. When the opposition of the day calls a hartal, they also call a media conference. If the media collectively refused to convey the message, however, it's doubtful if the hartal would even get off the ground. Hartals are probably the most damaging to our economy here and to our image abroad because many times they are so infantile, personal, and petty. Many of our brothers and sisters live hand-to-mouth and depending on the few taka they earn to get by, feed and clothe their families. They don't live in luxury homes in Dhanmondi or Gulshan and wear the most expensive clothes. We're allegedly a country promoting Islamic values, but at what point before or during a hartal is the wellbeing of our starving brothers and sisters given consideration? Maybe the media should reconsider its role and ask itself what contribution it's making towards the suffering of untold innocent families by announcing hartals. We took a vote in the office and all agree hartals are cancerous tumours in our society that should be removed.